Great blog post by Susan Avello. Thought I would re-share. A moving tale of an old man’s last months of life and the old student who returns for his last lesson. 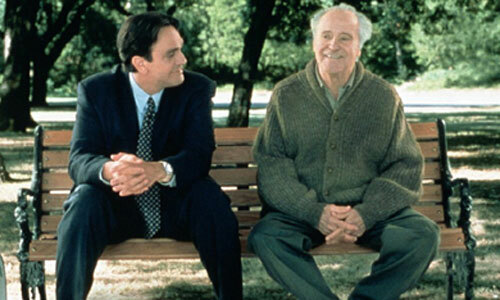 Tuesdays with Morrie is the story of “an old man, a young man, and life’s greatest lesson”. It is based on the true story of Morrie Schwartz, the author Mitch Albom’s college professor. I recently watched the movie through NETFLIX and was so moved and inspired to be aware of the “little things in life” by this passionate story. Morrie has been diagnosed with amyotrophic lateral sclerosis (ALS), otherwise known as Lou Gehrig’s disease, a debilitating and terminal disease that affects the neurological system. The now successful sports writer, Mitch Albom hasn’t seen his old professor since he hugged him after graduation years ago. Mitch firsts learns of Morrie’s illness after seeing Morrie being interviewed by Ted Koppel on Nightline. This prompted the first of many visits to his old professor, where his lessons continued. When Mitch and Morrie would meet up back in the days when Mitch was still studying at Brandeis University, they would meet on a Tuesday, so once again they fell into a weekly Tuesday visits. “We’re Tuesday people” Morrie had once said regarding these visits which became life lessons for Mitch. Mitch was one of numerous friends, family and acquaintances who traveled to visit Morrie in his last months of life. Mitch, a workaholic, focused on success and having little time for much else, slowly changes to a man who begins to realize the importance of the little things in life. The purpose of Morrie’s lessons are to teach Mitch that true happiness wont come from success or money, but rather from appreciating the simple things in life and loving those close to him. As Mitch watches Morrie wither away, he learns lessons in acceptance, love, communication and openness. The life lessons that Morrie imparts are meaningful and poignant and although they are nothing new, most will enjoy the positive message this story offers. While Morrie comes across as a remarkable human being that obviously touched the lives of many and it is evident that the lessons he imparted on the author has changed and developed Mitch’s own character. Just as Morrie has helped changed the life of many of those around him, so do we. We do affect many of those in whom we come in contact, either in a positive way as Morrie, or in a negative way. This is a great story of care-giving, dying and friendship and how to cope with all three. Below is the final scene from the movie. Tuesdays with Morrie was first published in 1997 by Random House and again in 1998, 2007, 2008 and 2009 by Hachette Australia (ISBN 978-0-733-60955-8). It has been since made into a play of the same name starring Alvin Epstein and Jon Tenney as well as a TV movie starring Hank Azaria and Jack Lemmon. Albon has written several other books including Bo, The Five People You Meet in Heaven and For One More Day. This entry was posted in aging, caregiving, dying and tagged aging, appreciating what you have, caregiving, death, dying, end of life, end of life care, friends, grief, living, Tuesdays with Morrie. Bookmark the permalink.